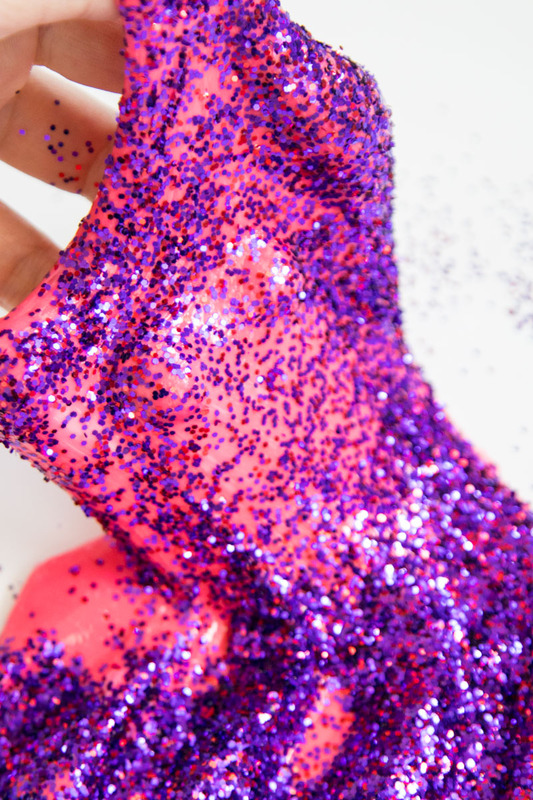 If you have a tween or teen girl in the house, you probably have a whole lot of homemade slime in bags, containers, and just about everywhere you can imagine, but do you have glitter slime yet? Glitter Slime is my girls’ new obsession. 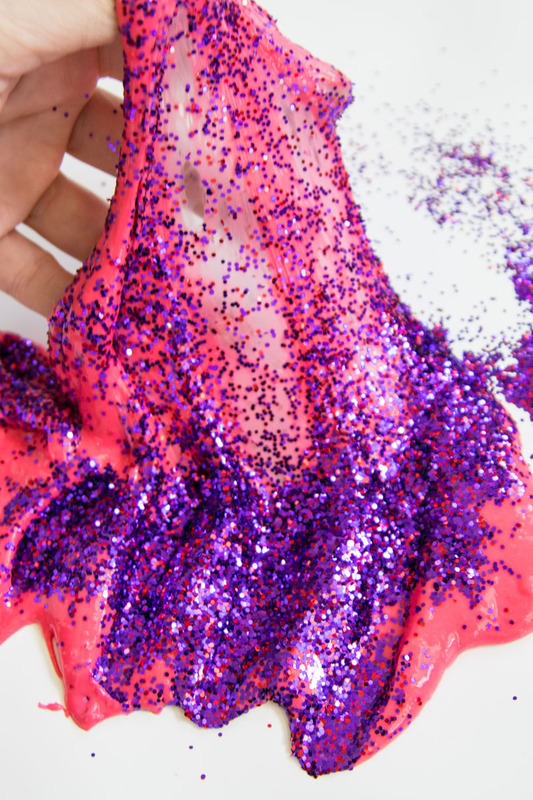 If you are looking for a borax free slime recipe, this kid safe glitter slime tutorial is going to knock your socks off! My kid safe slime recipe is perfect for an afternoon summer activity, or anytime! Kids can’t get enough of it because glitter slime is so beautiful for them to look at and fun play with. What makes this a kid safe slime recipe? What does that even mean? When diy slime started to become increasingly popular among kids at home, several children started to receive horrible blisters and third-degree burns. It turns out that borax, an ingredient that is commonly found in slime recipes, was causing terrible skin reactions! And since borax is a cleaning chemical, slime that a toddler or preschooler is going to play with should always be slime without borax! Are you looking for another fantastic slime making tip? Shop online for your all of your slime making ingredients and supplies, AND buy in bulk! None of the stores nearby ever carry the large bottles of glue we need. One batch of slime, we always make 2, takes one small bottle. If you will be making a lot of slime, and believe me, you will, order a large bottle of glue. 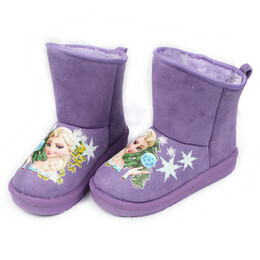 I get my starch online too. Start by adding the liquid starch and the glue in the bowl. If adding food color, add it here. Continue to stir until it starts to form together. The switch to playing with it. This will finish it, making it come together. Once the slime together, add the glitter. One fun way to mix the glitter in, is to stretch out the slime and pour the glitter on top. 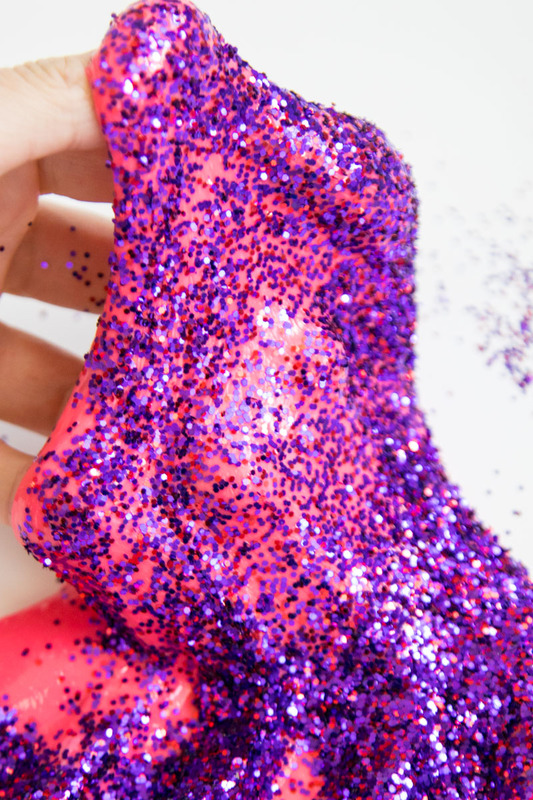 Then as the glitter slime is played with, the glitter will get incorporated. Pro Tip: Love making slime? Order glue and liquid starch in larger quantities online to save and spend less time running to the store! Looking for more slime recipes? Try making Bubble Wrap Crunchy Slime and Monster Slime. Looking for a borax free slime recipe? This kid safe slime recipe is perfect for an afternoon summer activity or anytime. 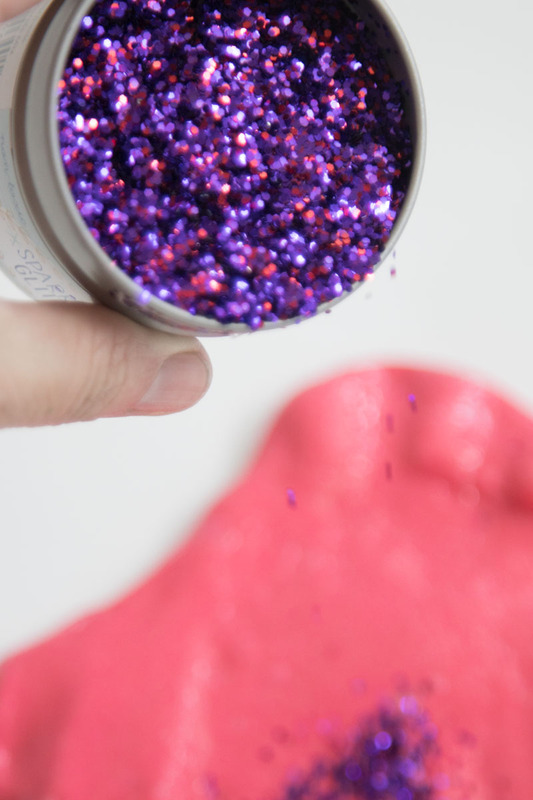 Glitter slime is beautiful for kids to look at and play with.